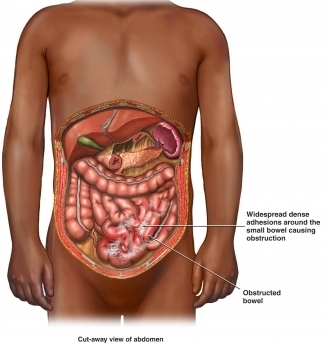 Small bowel obstruction means the small intestine is partially or totally blocked. When this happens, the contents of the intestine cannot properly get out of the body. Stools, fluid, and gas build up inside the intestine. This is a potentially serious condition that requires urgent medical care. Bowel obstruction may be caused by a mechanical problem. In this case, something inside the body blocks the movement of material through the intestine. It can also be caused by ileus , a slowing down or stopping of bowel activity. Ileus is a nonmechanical type of obstruction, which may also be referred to as pseudo-obstruction. Ileus may be caused by surgery on the intestine or certain medications such as opioids. Ileus pain is often less severe than mechanical small bowel obstruction. You will be asked about your symptoms and medical history. A physical exam will be done. The exam will include listening for bowel sounds in your stomach. Very high pitched bowel sounds heard through a stethoscope suggest mechanical bowel obstruction. Conversely, ileus often produces no bowel sounds. Treatment depends on the cause and severity of the obstruction. You will usually require treatment by a specialist. 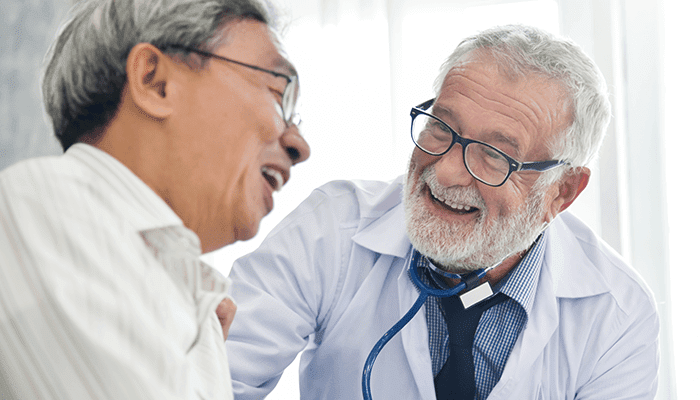 Your doctor will also treat you for any underlying conditions that contribute to small bowel obstruction. Monitoring and IV fluids—Observation at a hospital may be needed to see if the blockage will get better on its own. No food will be allowed and fluids will be given through an IV. Nasogastric tube—A tube is inserted through the nose and into the stomach to remove fluids and gas, which can promptly relieve pain and pressure. It will be left in place until the intestines are working well. Catheterization—A tube is placed in the bladder to drain and test urine. 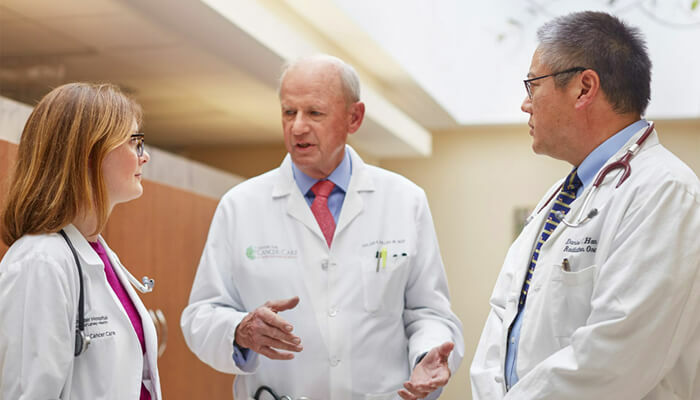 There are no current guidelines to prevent small bowel obstruction. Managing any underlying conditions such as Crohn disease, can reduce your chances. Abdominal adhesions. National Institute of Diabetes and Digestive and Kidney Diseases website. Available at: https://www.niddk.nih.gov/health-information/digestive-diseases/abdominal-adhesions. Updated September 2013. Accessed January 9, 2018. Baron TH. Acute colonic obstruction. Gastrointest Endosc Clin N Am. 2007;(17)2:323-329. Bonin EA, Baron TH. Update on the indications and use of colonic stents. Curr Gastroenterol Rep. 2010;12(5):374-382. Gastrointestinal complications—for health professionals (PDQ). National Cancer Institute website. Available at: https://www.cancer.gov/about-cancer/treatment/side-effects/constipation/gi-complications-hp-pdq. Updated May 10, 2017. Accessed January 9, 2018. Intestinal pseudo-obstruction. National Institute of Diabetes and Digestive and Kidney Diseases website. Available at: http://www.niddk.nih.gov/health-information/health-topics/digestive-diseases/intestinal-pseudo-obstruction/Pages/facts.aspx. Updated February 2014. Accessed January 9, 2018. Kulaylat MN, Doerr RJ. Small bowel obstruction. Available at: https://www.ncbi.nlm.nih.gov/books/NBK6873. Accessed January 9, 2018. Small bowel obstruction. EBSCO DynaMed Plus website. Available at: https://www.dynamed.com/topics/dmp~AN~T116815/Small-bowel-obstruction . Updated August 9, 2017. Accessed January 9, 2018. 4/7/2014 DynaMed Plus Systematic Literature Surveillance https://www.dynamed.com/topics/dmp~AN~T116815/Small-bowel-obstruction : Katz DS, Baker ME, Rosen MP, et al. Suspected small bowel obstruction. American College of Radiology (ACR) Appropriateness Criteria. Available at: https://acsearch.acr.org/docs/69476/Narrative. Updated 2013.